These are the perfect little Party Favors/Treat Bags for your kiddos school party or where ever your party may be this Halloween season. If you use any of these ideas I'm sure you will be the talk of the party! Roll paper to form cone and secure edges with double-sided tape.Use a standard hole punch to punch each side of the cone to accommodate the ribbon handle. Thread ribbon through holes and knot on each side inside the cone so the knots aren't visible. Tie bows and attach to the outside of the cone, covering the holes made for the handle. 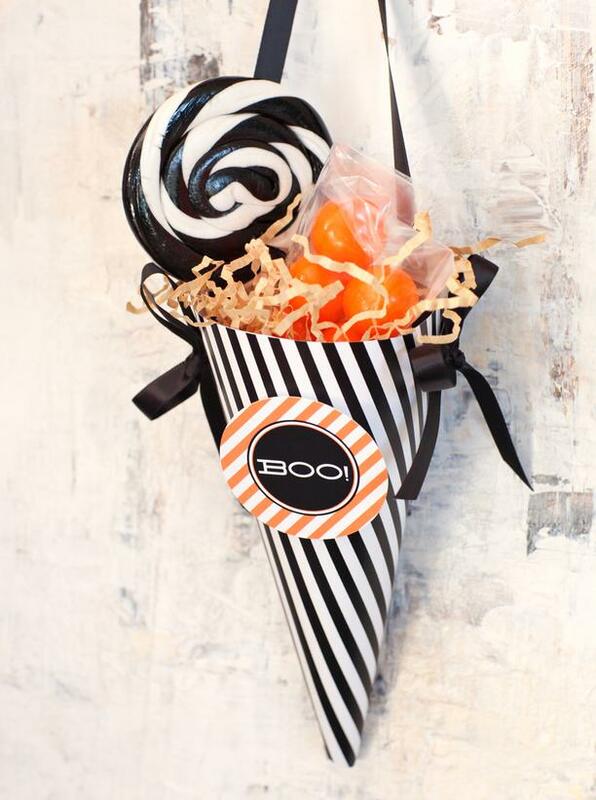 Fill cone with crinkle filler or tissue paper, then top with an assortment of candy, small toys or Halloween trinkets. With so much candy around at Halloween parties, a salty snack will hit the spot. Whip up some homemade kettle-popped corn or one of our popcorn recipes below and place in scallop-edged cups. Embellish with dimensional scrapbooking stickers (found at craft stores) or one of our free printables. If you're sending a cup home with your party guests, wrap it in cellophane and tie with ribbon so the popcorn will stay fresh. 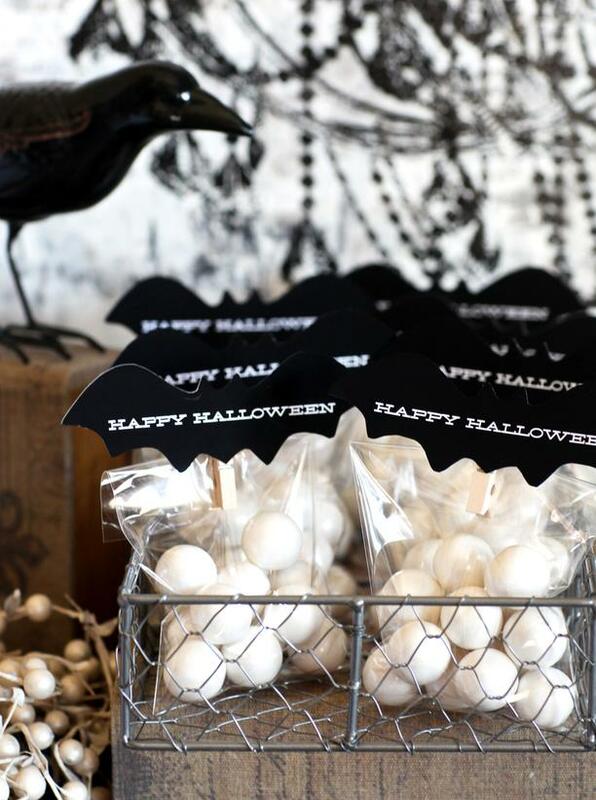 Easily turn wooden clothespins into cute Halloween bag clips. Download our bat-shaped template, print it onto card stock, cut out, then attach it to the clothespin with hot glue or double-sided tape. 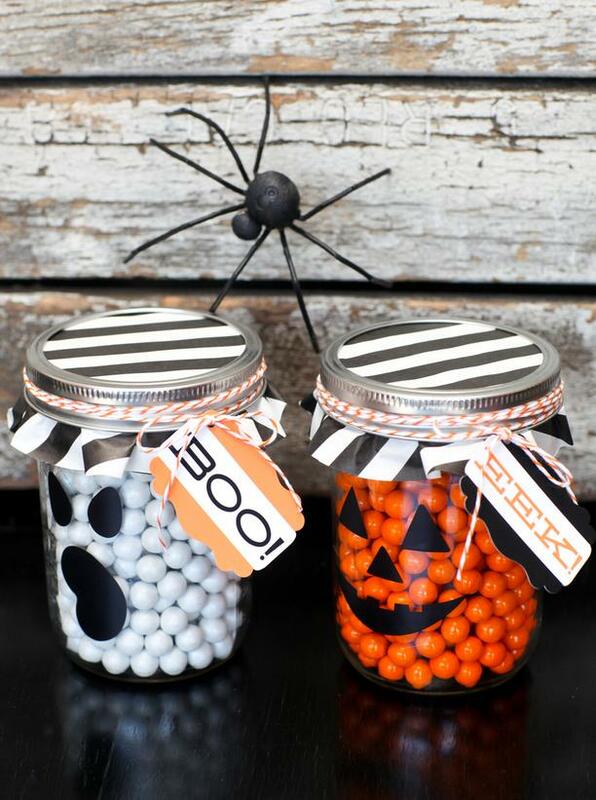 Fill a clear bag with Halloween candy or gumballs and attach the clip for a fun favor. Everyone loves cupcakes, especially kids! Place cupcakes in paper or plastic bowls and wrap with cellophane for a portable container they can take with them. Add one of our free printable Halloween tags to dress it up. 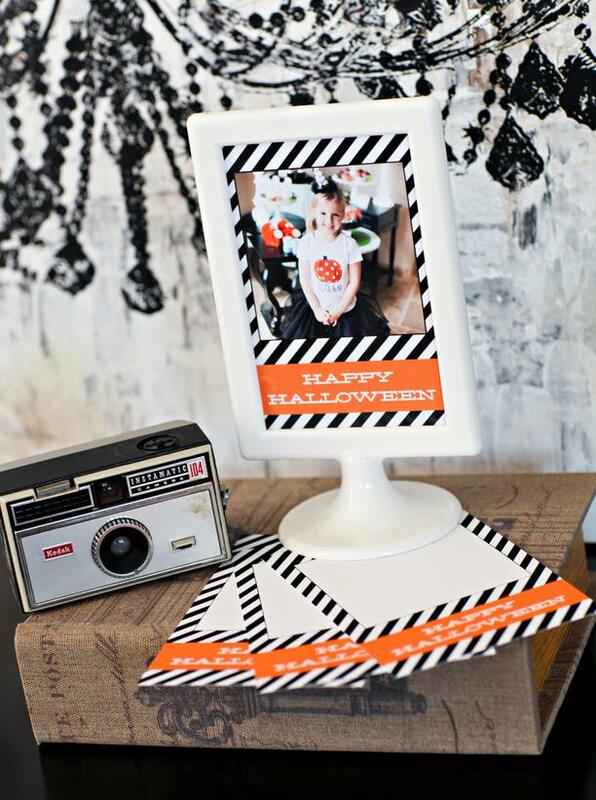 This photo frame idea is perfect for photo booth or Halloween costume parties. Before the party, print and cut out several of the 4" x 6" frame designs (template below). You can also purchase several simple plastic frames, like this one from Ikea, to hold the finished photos. As each guest arrives, take their photo, then print out the photos during the party. Insert photos in printed frames and give them to departing guests as party favors. Mason jars are everywhere these days and they're a great, affordable party favor. For Halloween, fill with white candy to make a ghost or orange candy to make a pumpkin. Top with a circle cut from our printable black-and-white striped paper and replace the lid. Use decals or stickers to create the ghost or pumpkin face. Tie on one of our printable tags with twine to complete the look. Mini candy bones give these marshmallow treats a crunchy texture kids love. 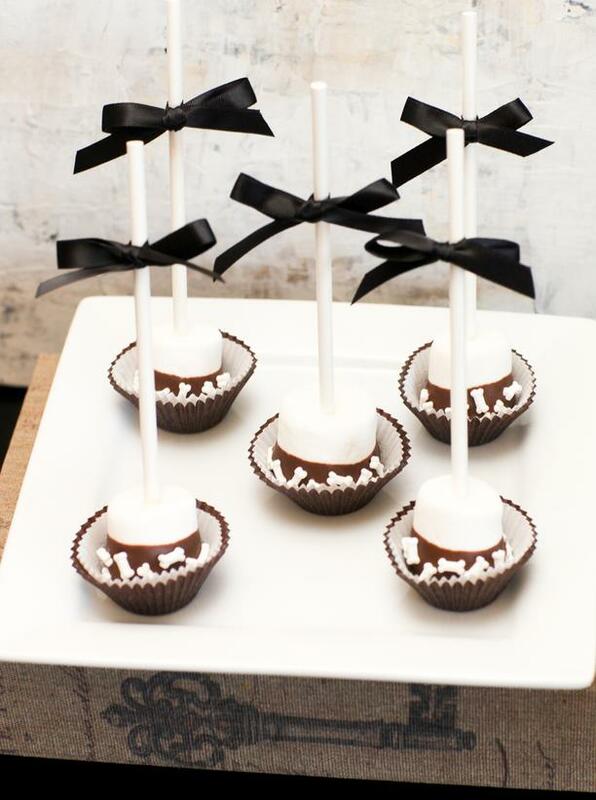 To create them, skewer a regular-sized marshmallow onto a 6-inch lollipop stick. Dip into melted chocolate and, while the chocolate is still warm, roll in candy bones. 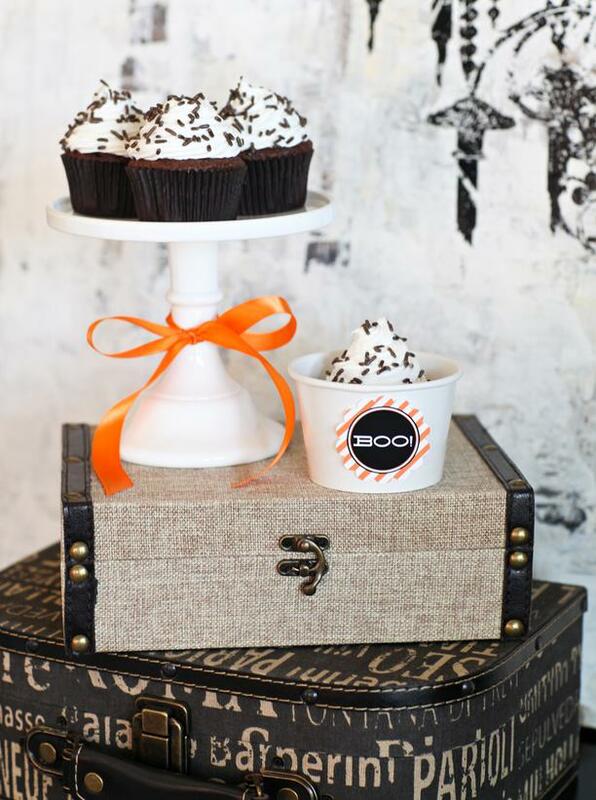 For perfect presentation, display in small cupcake liners and top each stick with a little black bow. 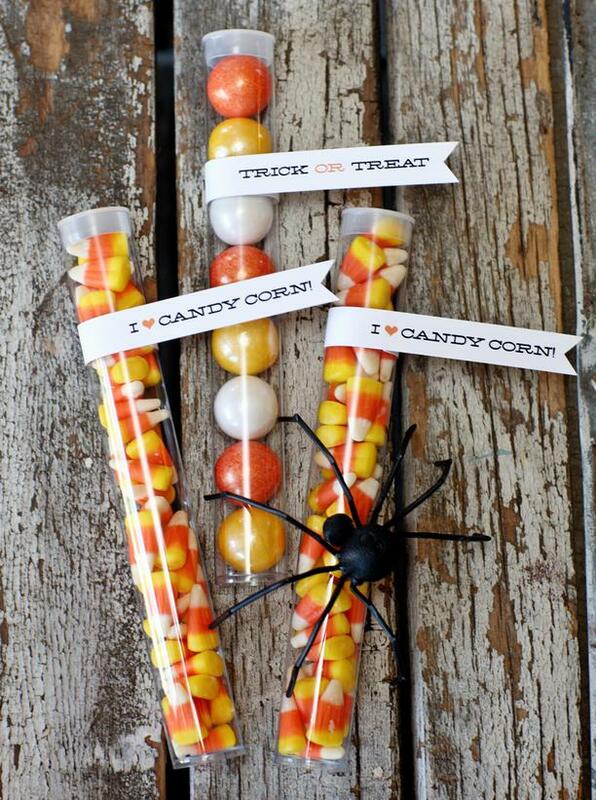 These clear tubes are turning up at parties everywhere not only because they're adorable, but because they're so easy! 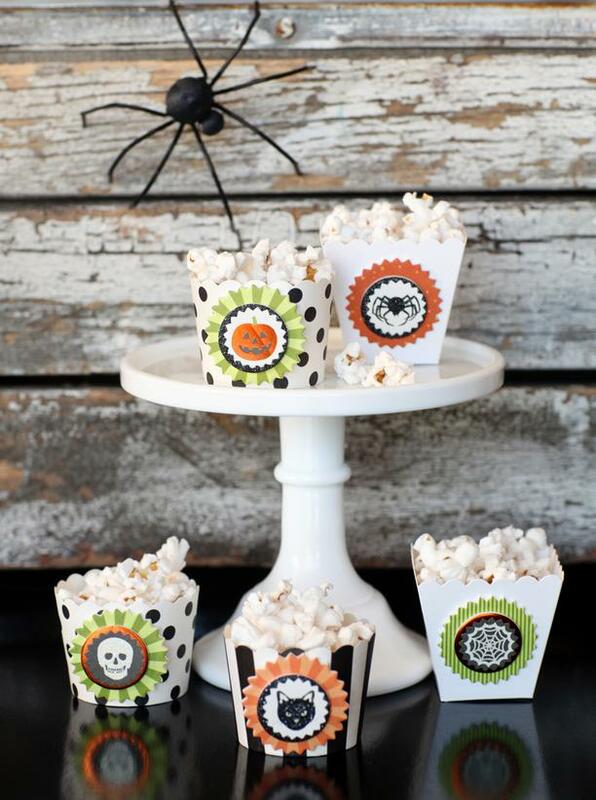 Just fill with candy or gumballs and top with a printable Halloween flag design.